Faster-than-Nyquist (FTN) signaling is a promising non-orthogonal transmission technique to considerably improve the spectral efficiency. 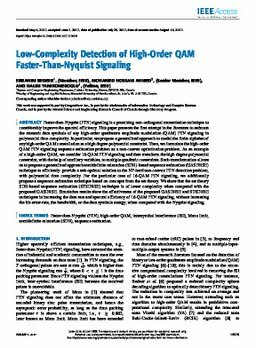 This paper presents the first attempt in the literature to estimate the transmit data symbols of any high-order quadrature amplitude modulation (QAM) FTN signaling in polynomial time complexity. In particular, we propose a generalized approach to model the finite alphabet of any high-order QAM constellation as a high degree polynomial constraint. Then, we formulate the high-order QAM FTN signaling sequence estimation problem as a non-convex optimization problem. As an example of a high-order QAM, we consider 16-QAM FTN signaling and then transform the high degree polynomial constraint, with the help of auxiliary variables, to multiple quadratic constraints. Such transformation allows us to propose a generalized approach semidefinite relaxation (SDR)- based sequence estimation (GASDRSE) technique to efficiently provide a sub-optimal solution to the NP-hard non-convex FTN detection problem, with polynomial time complexity. For the particular case of 16-QAM FTN signaling, we additionally propose a sequence estimation technique based on concepts from the set theory. We show that the set theory SDR-based sequence estimation (STSDRSE) technique is of lower complexity when compared to the proposed GASDRSE. Simulation results show the effectiveness of the proposed GASDRSE and STSDRSE techniques in increasing the data rate and spectral efficiency of 16-QAM FTN signaling, without increasing the bit-errorrate (BER), the bandwidth, or the data symbols energy, when compared to Nyquist signaling.